S I G N & D I G I T A L G R A P H I C S • April 2018 • 73 PROTECTIVE COAT FOR ENGRAVED PRODUCTS Gemini, Cannon Falls, Minnesota, introduces Dura-Guard, a new pro- tective coating option for its Duets Laser XT high-performance line of laser and rotary engravable material. Ideal for high traffic, high-contact signage, wayfinding and industrial labeling, Duets Laser XT with Dura- Guard provides the durability required for more demanding applications. Dura-Guard also makes post-production cleaning easier, saving laser and rotary engraving operators time and money. The Dura-Guard option is available on any pigmented Duets Laser XT SKU in 1/16˝ or 1/8˝ thicknesses. Formulated to resist the extremes of weather and sun, Duets Laser XT is offered in a variety of color and fin- ish combinations, and is available in-stock nationwide from the Duets Partner Network of leading distributors. For informa- tion, visit DuetsByGemini.com. NEXT-GENERATION PRINTER PLATFORM Durst Phototechnik AG, Lienz, Austria—parent company of Durst Image Technology US, Rochester, New York— announces the launch of a new printing platform: the P5 Series. The first member of the P5 family is the flagship P5 250 HS. The unit is targeted towards high volume industrial production, as well as one-offs in offset quality. The P5 technology consists of a series of new generation printers along with new software and workflow solutions developed in-house. The P5 family also has touch- operation based user interfaces and leading-edge remote service capabilities. Features include print volume capability For more information, visit https://durstus.com. 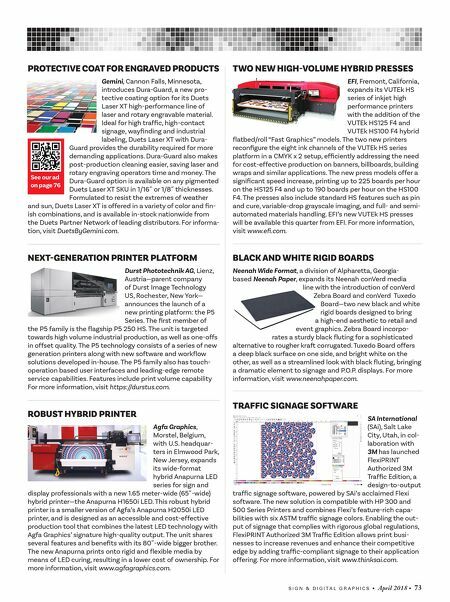 ROBUST HYBRID PRINTER Agfa Graphics, Morstel, Belgium, with U.S. headquar- ters in Elmwood Park, New Jersey, expands its wide-format hybrid Anapurna LED series for sign and display professionals with a new 1.65 meter-wide (65˝-wide) hybrid printer—the Anapurna H1650i LED. This robust hybrid printer is a smaller version of Agfa's Anapurna H2050i LED printer, and is designed as an accessible and cost-effective production tool that combines the latest LED technology with Agfa Graphics' signature high-quality output. The unit shares several features and benefits with its 80˝-wide bigger brother. The new Anapurna prints onto rigid and flexible media by means of LED curing, resulting in a lower cost of ownership. For more information, visit www.agfagraphics.com. 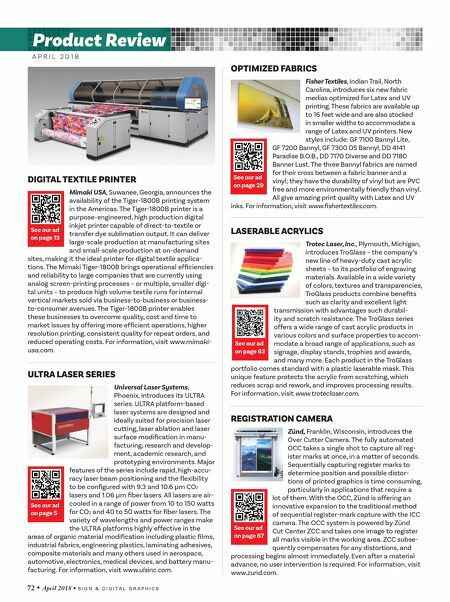 See our ad on page 76 TWO NEW HIGH-VOLUME HYBRID PRESSES EFI, Fremont, California, expands its VUTEk HS series of inkjet high performance printers with the addition of the VUTEk HS125 F4 and VUTEk HS100 F4 hybrid flatbed/roll "Fast Graphics" models. The two new printers reconfigure the eight ink channels of the VUTEk HS series platform in a CMYK x 2 setup, efficiently addressing the need for cost-effective production on banners, billboards, building wraps and similar applications. The new press models offer a significant speed increase, printing up to 225 boards per hour on the HS125 F4 and up to 190 boards per hour on the HS100 F4. The presses also include standard HS features such as pin and cure, variable-drop grayscale imaging, and full- and semi- automated materials handling. EFI's new VUTEk HS presses will be available this quarter from EFI. For more information, visit www.efi.com. BLACK AND WHITE RIGID BOARDS Neenah Wide Format, a division of Alpharetta, Georgia- based Neenah Paper, expands its Neenah conVerd media line with the introduction of conVerd Zebra Board and conVerd Tuxedo Board—two new black and white rigid boards designed to bring a high-end aesthetic to retail and event graphics. Zebra Board incorpo- rates a sturdy black fluting for a sophisticated alternative to rougher kraft corrugated. Tuxedo Board offers a deep black surface on one side, and bright white on the other, as well as a streamlined look with black fluting, bringing a dramatic element to signage and P.O.P. displays. For more information, visit www.neenahpaper.com. TRAFFIC SIGNAGE SOFTWARE SA International (SAi), Salt Lake City, Utah, in col- laboration with 3M has launched FlexiPRINT Authorized 3M Traffic Edition, a design-to-output traffic signage software, powered by SAi's acclaimed Flexi software. The new solution is compatible with HP 300 and 500 Series Printers and combines Flexi's feature-rich capa- bilities with six ASTM traffic signage colors. Enabling the out- put of signage that complies with rigorous global regulations, FlexiPRINT Authorized 3M Traffic Edition allows print busi- nesses to increase revenues and enhance their competitive edge by adding traffic-compliant signage to their application offering. For more information, visit www.thinksai.com.